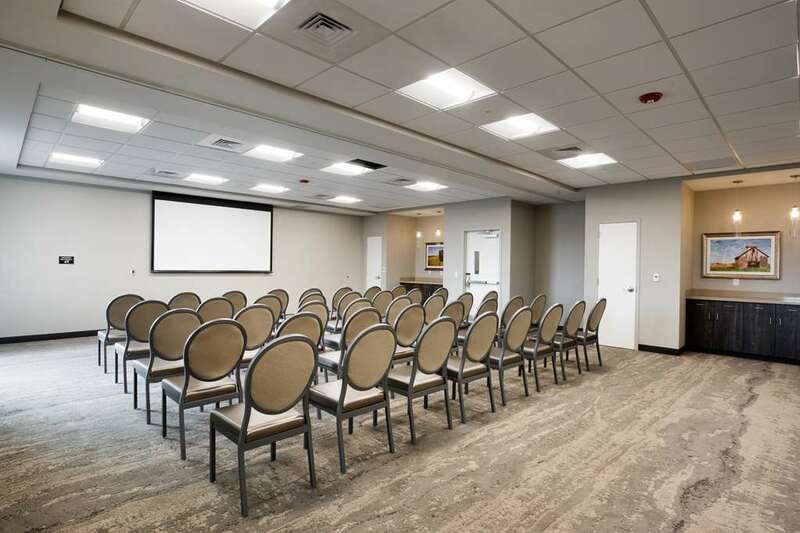 Opened in October 2018, the Best Western Plus West Lawrence is a beautifully designed 112 guest room facility features an indoor heated swimming pool, free fitness facility, and an extensive full hot breakfast is included in your room rate. The hotel offers a lobby bar with nightly drink specials and appetizers. Unwind from your busy day by our outdoor fire pit with comfortable seating. We also feature large gas grills with grill tools should you decide to do some tailgating prior to the big game. Complimentary high-speed Internet is available throughout the hotel, and we are the closest hotel in Lawrence to Rock Chalk Park, Jayhawk Tennis Center, and the Lawrence Sports Pavilion. From: Kansas City International Airport. Take I-29 South to I-70 West via I-435 to I-70 West. Exit 197 to K-10 and exit to 6th Street to George Williams Drive. The Best Western Plus West Lawrence is just ahead. From: Downtown Lawrence. Take 6th Street to Georgie Williams Drive and turn right. The Best Western Plus West Lawrence is just ahead. From: University of Kansas. Take Jayhawk Boulevard and head west on Irving Hill Road. Turn right onto Burdick Drive and then turn left onto W 15th Street. Continue onto Bob Billings Parkway. Turn right onto George Williams Way. At the traffic circle, continue straight to stay on George Williams Way. The Best Western Plus West Lawrence is just ahead. 4.4 mile(s) from Johnny's West Tavern, Full Service, American, Open for: lunch, dinner, Sports bar and grill. 4.4 mile(s) from Salty Igauna, Full Service, Mexican, Open for: lunch, dinner, Mexican food with a bar. 4.4 mile(s) from 6 Mile Chop House, Full Service, Steak House, Open for: lunch, dinner, Prime steaks to savory seafood and appetizers. Six Mile offers extensive, well-priced wine list, private dining for large parties and seasonal patio dining. Volleyball - .5 mile(s) from Lawrence Sports Pavilion, 181,000-square-foot facility Courts: 8 full-size basketball or 16 full-size volleyball indoor soccer/sports arena 1/8-mile indoor walking/jogging track. Outdoor walking/jogging trails. 5.9 mile(s) from Wonder Fair, is an Art Gallery, Design Shop, Stationer, and Art Supply located at 841 Massachusetts Street, Lawrence, Kansas. 7.9 mile(s) from Target , Department store which sells discounted home decor, electronics, apparel and small appliances. 7.5 mile(s) from Kohl's , department store featuring housewares, apparel, jewelry, and small appliances. 7.5 mile(s) from Bed Bath & Beyond, houseware retailer which carries a wide array of home d cor, bedding, and kitchen products, as well as small appliances. 1.7 mile(s) from Walmart , department store selling discounted housewares, apparel, and electronics, as well as groceries, health and beauty supplies. 6.0 mile(s) from Weaver's Department Store, Lawrence's department store since 1857. Featuring the best national brands, the best service, and the best value in the area. Located in Historic Downtown. 21 mile(s) from Baker University, is a private Christian university located in Baldwin City, Kansas, United States. Founded in 1858, it is the first university officially founded in Kansas and is affiliated with the United Methodist Church. 13 mile(s) from API Foils, a leading manufacturer and distributor of foils, laminates and holographics. Exceptional brand enhancement for consumer goods and printed media. 14 mile(s) from General Dynamics, a leading manufacturer and distributor of foils, laminates and holographics. Exceptional brand enhancement for consumer goods and printed media. 7 mile(s) from Lawrence Paper Company, from industrial boxes and retail displays to innovative, custom box designs shipped directly from our fulfillment center, Lawrence Paper Company does it all. 5.6 mile(s) from Standard Beverage Corporation, is your leading distributor of fine wines, spirits and beer, and is the only large distributor that is Kansas owned. 5.9 mile(s) from K-mart Distribution, Sears Holdings company. Warehouse for K-mart and Sears Company. 3.1 mile(s) from Great American Insurance, member companies are subsidiaries of American Financial Group, Inc. (AFG). AFG is a Fortune 500 holding company whose common stock is listed on the New York Stock Exchange. 5.3 mile(s) from Lawrence Memorial Hospital, operates as a community hospital that provides health and wellness services for the people of Lawrence and the extended community in Kansas. 2.5 mile(s) from Atipa Technologies, is a privately held company in Lawrence, KS and is a Single Location business. Categorized under Computers, Peripherals, and Software. Our records show it was established in 1986 and incorporated in KS. 14 mile(s) from Grandstand Glassware, your partner for top quality custom printed glassware, apparel, promotional items and creative branding. Serving the craft beverage industry since 1988.